I’m actually crying and I’m in public and thats ok! Can we please remove the stigma that there is something ‘wrong’ if tears come out of our eyes…. As the reason I have this water leakage from my tear ducts (this time… lol I can just hear my partner laughing now), is because I am grateful and I am tuning into the feeling. Yes the water works happen often with me the last few years as I allow myself to feel more (which has a lot of power in it – if you are thinking that I am torturing myself) and it’s not just when I am sad. Often when I am ‘feeling’ or processing things. < I didn’t mean to write about this actually but I had to come back and edit my little list of gratitude and address the tears thing as I believe, wholeheartedly, that it’s important for people to learn to fully express themselves and that we (as a culture)… get to move past the stigma that the previous generation attached to the act of crying. Anyway let’s get back to ma list… I just wanted to share a list of things I am grateful for with you (whoever you are reading this – thank you very much for giving me your attention). I’m grateful that I can work from anywhere. You see, I have noticed that for some reason unpacking boxes and choosing where to put things as you pull them out of boxes, is actually quite draining on the brain. I could actually laugh at myself right now, as I would tell anyone else who said this to ‘harden up’ if I hadn’t felt it myself! Lol. I’m incredibly grateful, for my general lack of routine and ability to work from that space. Don’t get me wrong… and I usually HATE routine (call me weird, I know, but we are all different). However the last few days, with moving house and life being turned upside down I have realised I crave some time to ‘seize the day’.. (and do the most important things to me that I need to do by myself, work, gratitude lists, meditation, moving my body). 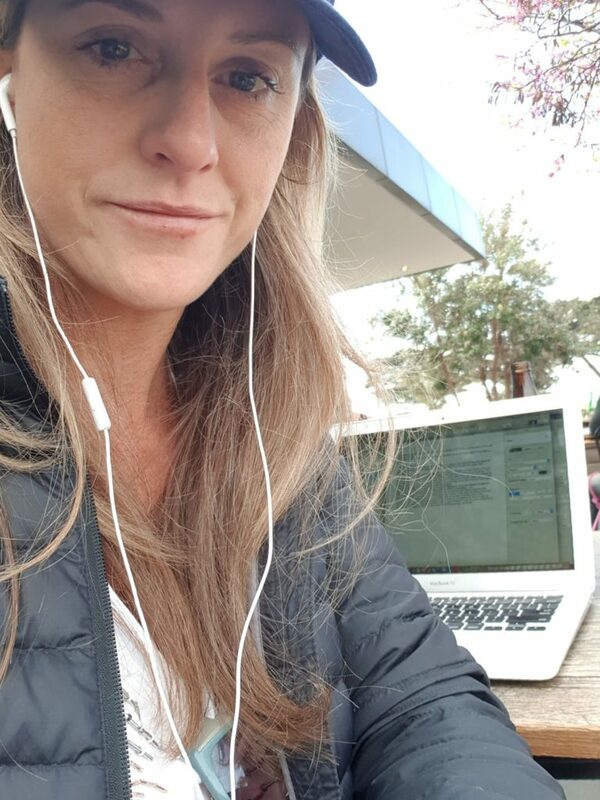 That I live in a place where people come to ‘holiday’ (as I watch them walk past me, every man and his dog is here for the weekend, which is why I don’t usually find myself in cafes these days, as I prefer to work from home). I am grateful for that choice. I love the fact that there are beautiful places all around me, that we live in a country that has no war, other than the ones we usually face internally and with the politics, who really make us focus on first world problems. That I am fully supported by those around me who help me with just the daily chores of life, so I don’t have to often spend time doing those things, and instead I can focus on my work, my clients and my daughter and other things to contribute to others. That I have a partner that is gorgeous that I love and he loves me and that it gets better every day, because I choose for it to. I love the fact that I have choice, that I can eat if I want to eat, simple I know, that I can feel more and more every day, that I have the ability and power (like we all do) to help as many people as possible through this amazing thing called the internet. That I have a beautiful new house to live in and great neighbours, who have already brought me champagne! < how good is that! I knew we’d be friends immediately, when I saw her at my front door with a bottle… lol.. I am so grateful for all this technology we have and the contrast it creates in life and that having a growing little person, actually allows me to have. It has made me reflect on human creation and the perspective of ‘why are we here’ even more than I normally would have. I am grateful for the deeper levels of love, fear and guilt it has allowed me to feel and the depth that has allowed my soul to experience. I am grateful for the compassion that has allowed me to have for other human beings and also myself. I am so grateful to be her guide and support in this world, as I am grateful for the fact that my mother was an amazing guide, even though her parents (by comparison weren’t as fabulous for her) and so to, was my father, who is now in heaven. I am grateful that I hear his voice telling me to start playing golf again, each time I drive past the golf course near my new house… (so I threatened Stella with Golf lessons. Threatened because she won’t voluntarily participate in any sport at the mo..). So stay tuned for pics to come. I’m grateful (now) that my father made me play golf for years every Saturday morning at 530am in the boys competition, (yes before it was light) and that I had one of the best coaches to teach me to play. (Omg I am just remembering him now – little old Arthur, the 72 year old who taught my father to play golf, also taught me. Some of his tactics included TALKING to the ball to tell it where it was going to go! Hahaha! Talk about starting the mindset work early! I think I was 11 at the time I started golf). I’m grateful that where I have just ordered food, they altered the menu for me (which they don’t usually do) because I HATE SULTANAS! I am grateful that I love my clients and my work and it satisfies my soul and I can’t wait to see what evolves in the next few years as a result. I must add that I am eternally grateful to have all my body functioning in epic health and all of my loved ones and friends and clients around me are in great health too! There you go. If you have read this far I am grateful for your time!